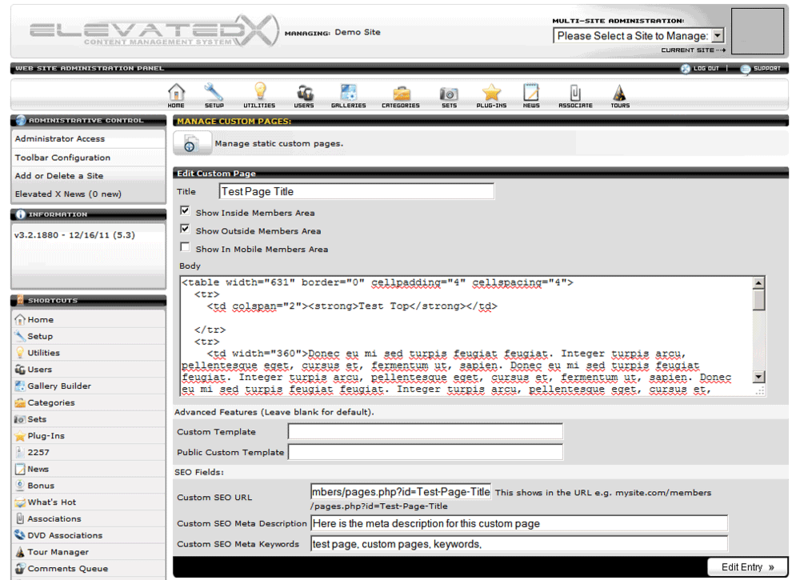 Custom Pages is free feature update in the most recent version of Elevated X 3.2. 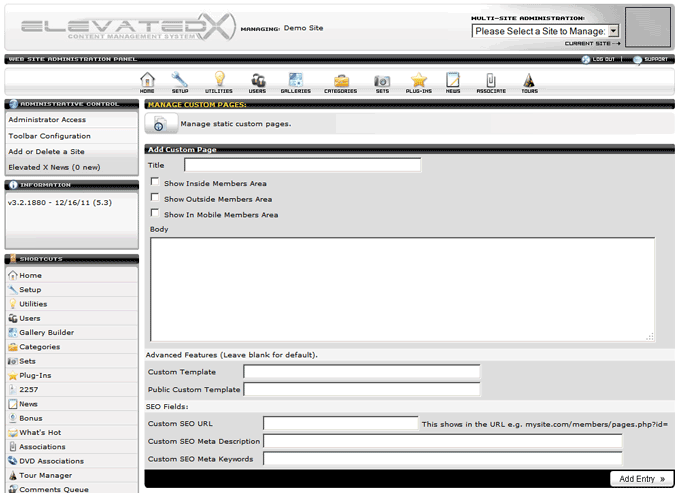 It allows you to display standard HTML code into page templates in your members and tour areas of your site. Each custom page has it's own URL. Iframes are supported as long as they fit inside the template. Each custom page can have a custom Smarty template to adjust the layout elements of the custom page. 1) Version 3.2 or later of Elevated X. 2) After the system update, we will upload some additional required smarty templates to your main smarty template folder and some new php pages to your members and tour areas. 3) To use the custom pages plugin, go to your plugin area of your CMS admin panel. 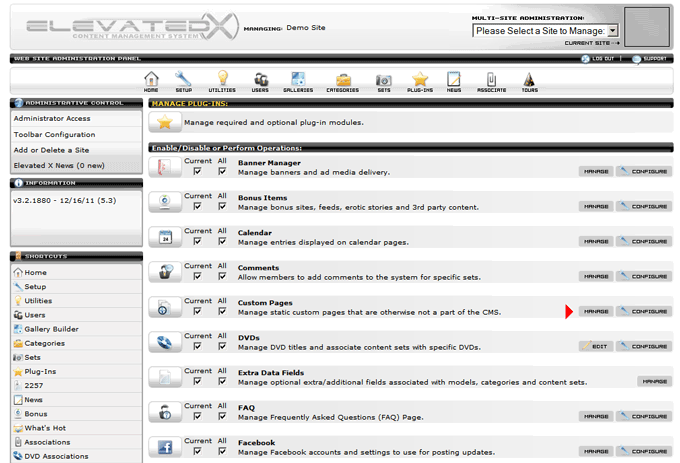 Located the "Custom pages" plugin and click "Manage"
4) click the "Add a new entry" button. 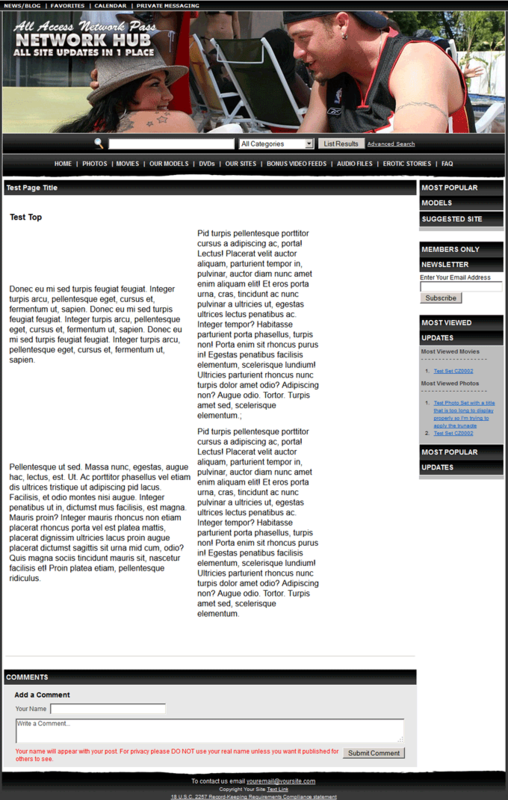 Title: Title of the pag that will appear in the browsers top title area. Body: This is where you paste your basic HTML code. All image links/references should use absolute paths. (full URLS to the images already uploaded on your server.) Iframes are supported but should be small enough to fit in your templates. Custom SEO URL: if you wish to change the SEO friendly url. THis will be the page name in the URL for your custom page. Custom SEO Meta Description: if you wish to create a unique meta description for this page. Custom SEO Meta Keywords: if you wish to create a unique meta keywords for this page. Click the "Edit Entry" and your new custom page will be availble via the following URLs.